Create First Fragment: The first fragment is created by taking the first 3,300 bytes of the 12,000-byte IP datagram. This includes the original header, which becomes the IP header of the first fragment (with certain fields changed as described below). So, 3,280 bytes of data are in the first fragment. This leaves 8,700 bytes to encapsulate (11,980 minus 3,280). Create Second Fragment: The next 3,280 bytes of data are taken from the 8,700 bytes that remain after the first fragment was built, and paired with a new header to create fragment #2. This leaves 5,420 bytes. Create Third Fragment: The third fragment is created from the next 3,280 bytes of data, with a 20-byte header. This leaves 2,140 bytes of data. Create Fourth Fragment: The remaining 2,140 bytes are placed into the fourth fragment, with a 20-byte header of course. I want to emphasize two important points here. First, IP fragmentation does not work by fully encapsulating the original IP message into the Data fields of the fragments. If this were done, the first 20 bytes of the Data field of the first fragment would contain the original IP header. This technique is used by some other protocols, such as the PPP Multilink Protocol, but not by IP. 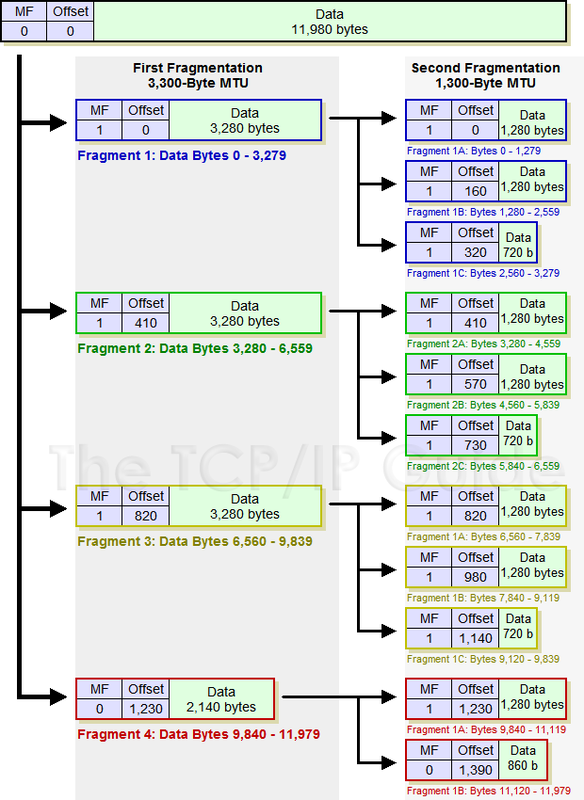 The original IP header is transformed into the IP header of the first fragment.